Lock Ian Evans hopes to keep his unbeaten Six Nations record intact as Wales begin their title defence against Ireland in Cardiff on Saturday. But the Osprey returns for his first game since injuring a knee in November accepting it will be an endurance test. He played in Wales' 2008 and 2012 Grand Slams, having missed the 2009 and 2011 tournaments amid a series of injuries. "I know what to expect and how I will be feeling during the game," said the 25-times-capped, 28-year-old Evans. "I am obviously confident in that area of coming back from eight weeks off. "Unfortunately, I've had lot of injuries in my career, but I know what to expect and how to deal with it." Wales have won only once since their 2012 tournament success - a 30-21 win over the Barbarians in Cardiff in June. Seven defeats have followed - their worst sequence since 2003 - four of them against Australia with Samoa, Argentina and the All Blacks completing also beating interim coach Robert Howley's men. 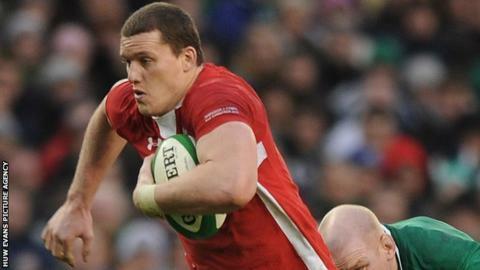 That has led to criticism of Wales coaches and players that Evans believes can rekindle winning Welsh form. "One thing I notice about Wales players is as soon as people start putting pressure on us and doubting us, we stand up and we want to be counted and to prove people wrong," said Evans. "A lot of people have got opinions and they are entitled to those. You have just got to accept that, really, and you have got to prove them wrong." And if Wales need a fact to boost morale ahead of the meeting with Ireland, three successive wins over their Celtic rivals could provide it. However, with Evans returning amid a lock injury crisis that has also ruled fellow Osprey Alun Wyn Jones, Perpignan's Luke Charteris and Bradley Davies, Newport Gwent Dragon Andrew Coombs completes Wales' lock partnership. They will be up against Irish duo Donnacha Ryan and Mike McCarthy while the well-established Paul O'Connell is injured and Donncha O'Callaghan is on the bench. Evans said: "I've known Andrew since we played junior rugby. He has put his hand up and he deserves his chance. "He brings physicality and aggression - you will get 100% off him. "Once that first whistle blows it will be the quickest 80 minutes of rugby in his life and all advice anyone gives you goes out of the window. "It's what you have been training for that will hopefully come through in the game. "Ireland have got (Donnacha) Ryan and (Mike) McCarthy in the second-row. "I've played against them before and they are quality players. "They will be trying to set out their stall and won't want to live in the shadows of Paul O'Connell and Donncha O'Callaghan. They will want to make their own names." WALES: Leigh Halfpenny (Blues); Alex Cuthbert (Blues), Jonathan Davies (Scarlets), Jamie Roberts (Blues), George North (Scarlets); Dan Biggar (Ospreys), Mike Phillips (Bayonne); Gethin Jenkins (Toulon), Matthew Rees (Scarlets), Adam Jones (Ospreys), Andrew Coombs (Dragons), Ian Evans (Ospreys), Aaron Shingler (Scarlets), Sam Warburton (Blues, capt), Toby Faletau (Dragons). REPLACEMENTS: Ken Owens (Scarlets), Paul James (Bath), Craig Mitchell (Exeter), Olly Kohn (Harlequins), Justin Tipuric (Ospreys), Lloyd Williams (Blues), James Hook (Perpignan), Scott Williams (Scarlets). IRELAND: R Kearney; C Gilroy, B O'Driscoll, G D'Arcy, S Zebo; J Sexton, C Murray; C Healy, R Best, M Ross; M McCarthy, D Ryan; P O'Mahony, S O'Brien, J Heaslip (capt).